I had the pleasure of speaking to the Uptown Rotary Club several years ago and am continually impressed by their community-mindedness and commitment to service. 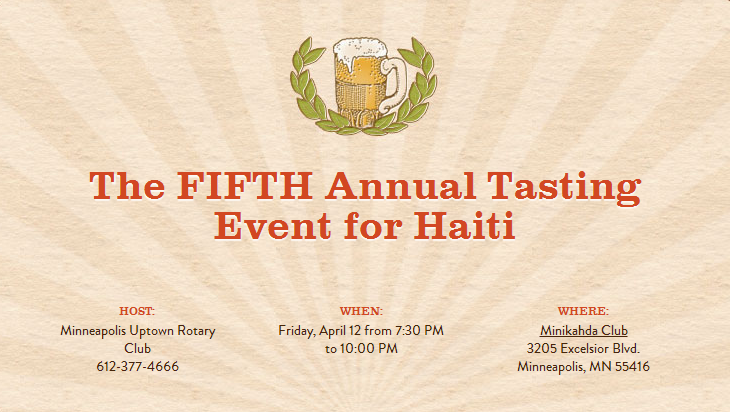 Below, see an invitation to the FIFTH Annual Tasting Event for Haiti, a craft beer tasting event to assist Haiti Outreach in its ongoing to develop and improve infrastructure in Haiti! As your own glass goes bottoms-up, it'll be for the benefit of sustainable water infrastructure installations across the Haitian island. Cheers to that! Join the Minneapolis Uptown Rotary club for a unique night of tasting fine artisan salumi, cheese and chocolate with local craft beers. David Merrill of Merrill Foods will lead our journey through the culinary delights while Tyler Anderson of Zipp's Liquors will teach us about local craft beers specifically chosen as perfect partners. 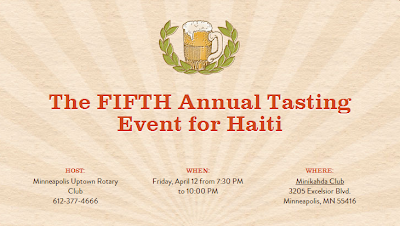 The cost for the event is $50 per person, part of which is tax deductible.Proceeds will go to sustainable water infrastructure installations provided by Haiti Outreach.To register, please visit our website or purchase tickets directly from an Uptown Rotary Club Member.